The other day we had a blizzard, dropping about 15 inches of snow on our area. 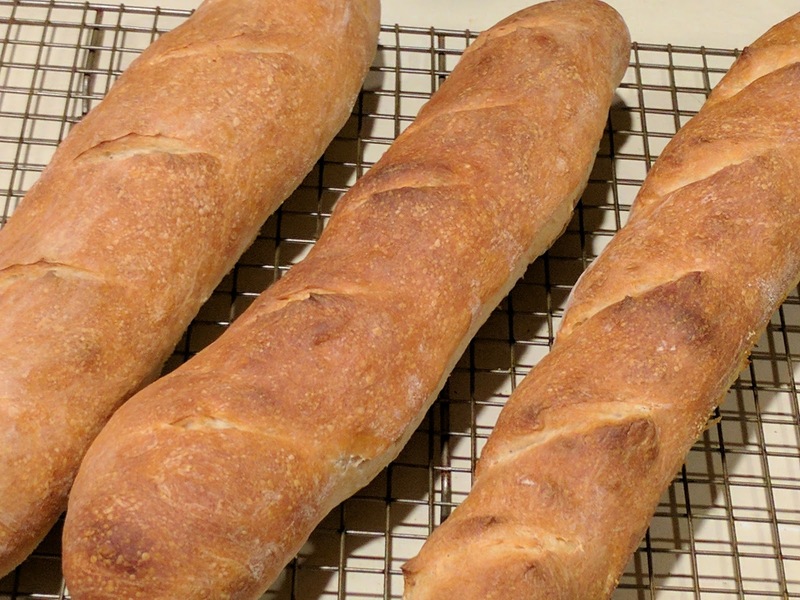 After spending a few hours at work (I went REALLY early so I could be done before the worst of the snow started) I tried a second time to make baguettes. This time, I used a recipe from one of my culinary school pals but I used the school method of folding the dough every hour to build up the air pockets. I was also much more careful about overproofing. I may, in fact, have underproofed slightly but that is less of a problem in this case. My friend has a different method for folding the dough and I'm going to try that next time and compare. Instead of the dough being flat, it's kept round and then the sides are folded up and over like flower petals. It'll be interesting to compare. Last night another friend came over and we had the bread with my homemade paté, some cheeses, and a really terrific artichoke spread she brought with her. The bread sliced easily and had some nice air pockets but didn't have quite the crumb I was looking for. This is why I want to try the other method and see what I get.